Race into an all-new adventure with the MySims! Start out at the driving school and learn the ways of the road. Race into an all-new adventure with the MySims! Start out at the driving school and learn the ways of the road. Work your way up to facing the toughest MySims rival racers and trickiest tracks in the land. 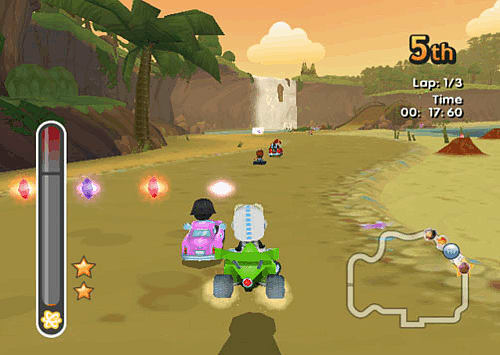 The more you win, the more you’ll be able to customize your kart and trick it out with new gadgets and power-ups. When you’re ready, take on your friends in four-player mode! Race to the Finish Line - Face a variety of MySim opponents or take on your friends! Compete with rival racers in one-on-one duels. 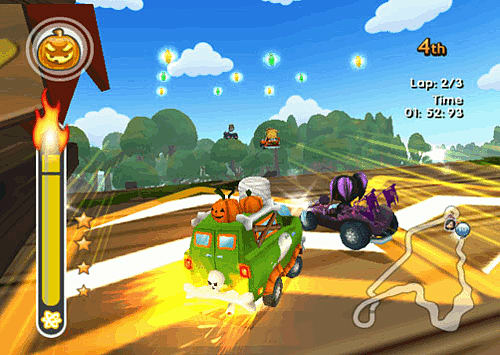 Get ahead of the curve with awesome power-ups such as the heat-seeking jack-o-lantern pumpkin or a bubble dropper. Kick Your Driving into High Gear - Bring back the glory days of Speedville by winning championships, completing challenges, and more! Design Your Own Car -Customize your car by swapping bodies, changing paint jobs and adding tons of accessories. Improve power, acceleration, and handling by mixing and matching engines, suspension, and tyres. Create Your Own MySim - Personalize your MySim’s appearance with new racing the med clothes and accessories. Improve Your Relationships, Improve Your Ride Befriend MySims and help them out to get car blueprints, car parts, and more! 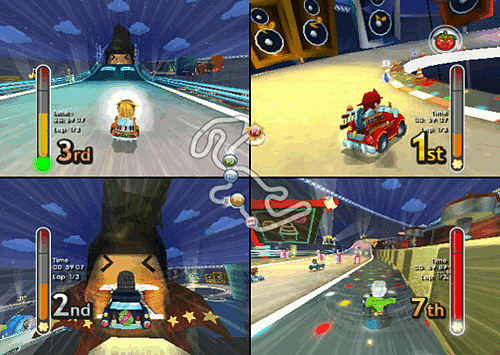 DS-Specific Feature -Up to four players can race each other using local wireless or Nintendo Wi-Fi.